Yarrow has one to several tall upright stems up to three feet tall, narrow fern-like leaves clustered at the base but found on the stem as well, and flat umbrella-shaped clusters of dense white flowers. One of its main characteristics is the odor of the crushed leaves--a strong aromatic herb rather like rosemary and sage. Yarrow has a weedy look to it and is often found in disturbed areas. The plant has a long and fabled history as a powerful healing herb used topically to staunch bleeding from wounds, cuts, and abrasions. The scientific name is derived from the mythical Greek hero, Achilles, who reportedly carried it with his army to treat battle wounds. It is also called staunch weed and soldier's woundwort. 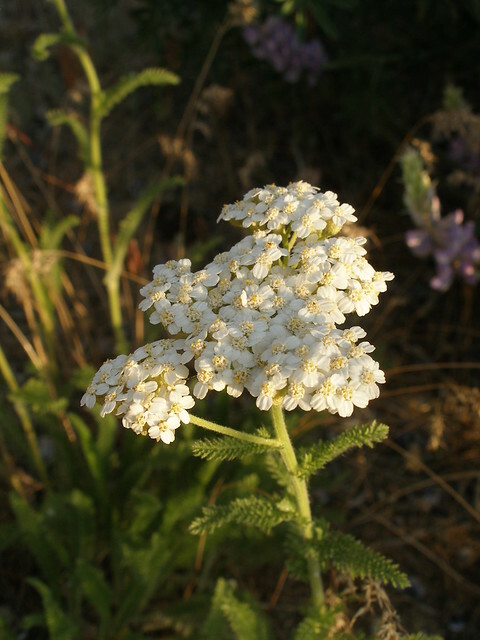 In the Northwest, Native Americans used yarrow to treat colds, flu, bladder trouble, venereal disease, sore eyes, diarrhea, stomach cramps, and dysentery.